Someone might be forgiven for coming to the Oregon Shakespeare Festival and coming to the conclusion that they don’t like Shakespeare very much. Part of the problem is the deference that American companies, especially companies that have large, touristy audiences to please, continue to pay to the Royal Shakespeare Company mode of production – the stolid, Peter Hall style of text recitation, the constant feeling that you can’t put on a play unless it’s explicitly seen to be made “relevant” to our own time, the endless drumming etc. One emerges from productions of Shakespeare plays here in Ashland with the feeling that the work is solid and unremarkable. If the two Shakespeares I have seen so far this year and the three I caught last year are anything to go by, I would have to say that the people here are much happier producing anything but the Bard’s works. Seagull is mesmerizing, as is Animal Crackers, which I caught last night and will say a bit about here today. Troilus and Cressida, on the other hand, only left a passably positive impression on me, as I'll describe below. And don’t get me started again on the snooze fest that is this year’s production of Henry V.
Maybe this is an indication that The Oregon Shakespeare Festival needs to find a new glow to its approach to Shakespeare (perhaps by bringing in directors who take a much more radical approach, though this may upset the middle brow contingent of its audience) or think about taking a year or two off the Bard completely. Which of course will never happen. Troilus: What I love about this production, staged by Rob Melrose and set in 2003 against the backdrop of the United States forces’ presence in Afghanistan, is its physicality. A skirmish with double swords, a blistering fist fight, a “play” fight between Ajax and Thersites which ends with the latter trapped helplessly between the former’s arms and legs like a fly in a cobweb. But for the most part, a predictable tone prevails. Shakespeare’s drama is skeptical about war and Melrose clobbers us over the head with this attitude. The soldiers, especially the Americans, are a dissolute bunch. They take drugs, shoot golf balls into the air from atop ancient ruins, shout and strut too much and generally behave like pigs. The male members of the cast also seem to spend a lot of time trying to upstage enough other. Yawn. Only the few scenes in the play involving women seem to lift the action onto a new plane. The wonderful wooing scene between the two lovers (sensitively played by Raffi Barsoumian and Tala Ashe), pestered on occasion by their Yentl-like uncle Pandarus (the alternately grating and brilliant Barzin Arkhavan), the moments when the black-shrouded and devout Cassandra, also played by Ashe, enters spewing prophesy in a ghostly fire and brimstone voice, the scene in which Helen and Paris enjoy a coke-addled afternoon by the pool, help to give the otherwise relentless denouement definition and much needed variety to the atmosphere and action. Animal Crackers: This production, directed by Allison Narver, is joyful. While the incredible physical and verbal dexterity of the ensemble cast beautifully recreates the Marx Brothers shtick, the production is a living, breathing thing and not a museum piece. The famous bits and jokes are all there (including Groucho’s line about shooting an elephant in his pajamas.) 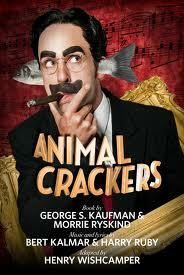 But having a bunch of modern day actors playing the Marx Brothers playing their stage and screen personas playing the characters within the action of Animal Crackers itself (Captain Spaulding, Ravelli, the Professor, Jamison etc) adds an extra, meta-theatrical dimension. Also, there’s a marvelous unpredictability to the proceedings. It was hard to tell how much the endlessly inventive Mark Bedard’s Groucho was ad libbing last night. But the corpsing on stage of a couple of actors when Bedard pushed bits of zanery as far as they could possibly go, was to the delight of the audience and a swelling of the overall energy in the room. The production is further gratifying because it reminds us that consummate performers – the ones who can sing, dance, act, be funny, be sad, play several musical instruments, juggle, perform cartwheels, engage in repartee with the audience – still exist in the world. It’s just that they don’t often get the chance to display all of their myriad talents at once. Hooray to OSF for finding these performers and showing us what they can do.